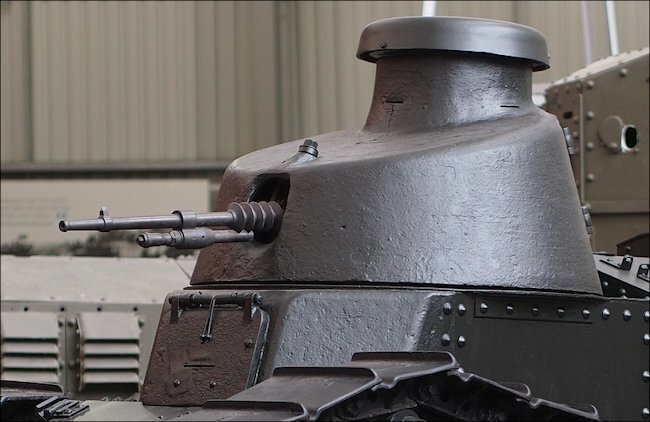 This French Renault FT Tank can be found at the Tank Museum, Bovington, Dorest, BH20 6JG, England. Their website is tankmuseum.org. The French word "Char" translated means tank. The number it is often called the Renault FT-17 in error. It was the model developed in 1917. The letters FT are the Renault company's factory code for this product. The letters are not an abbreviation for anything. 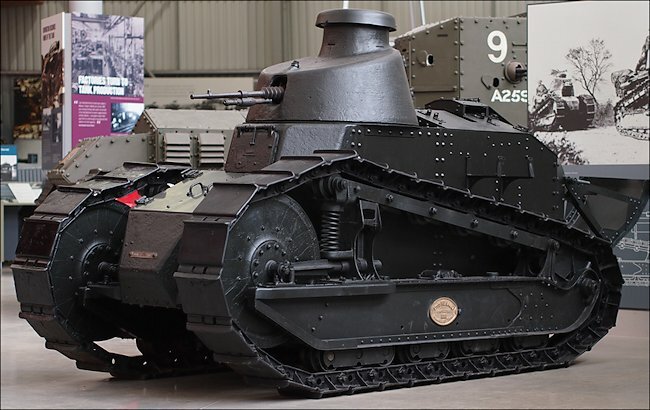 The manufactures stamped in number on this tank '12.17' means that this was the 12th tank built as part of the first batch of 150 tanks in 1917. It also has the French words 'non protégé' which means unprotected. This tank was built as a training vehicle. It was built with mild steel not armour plate. WW1 French Renault FT Tank training tank in pale blue livery. Notice the brass Renault manufacture's plate on the side. 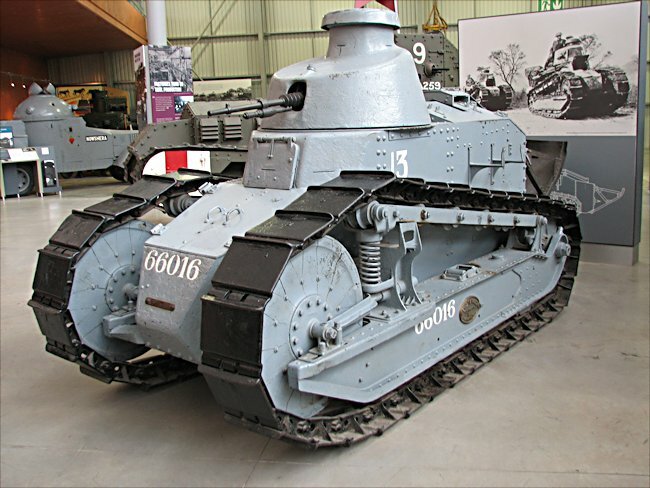 This version of the World War One French Renault FT tank was the most numerous. It was fitted with a Hotchkiss 8mm M1914 machine gun in a fully 360° revolving turret. It was meant as an infantry support weapon. It was not designed to fight other tanks. Some of the 3,000 FT tanks produced were fitted with a 37mm Puteaux SA18 short-barreled gun but the majority only carried machine guns. These tanks were still in use by the French Army during the German invasion of 1940. The only real improvement was the fitting of a 7.5mm Reibel machine gun in 1931. This tank had no chance when it had to face German Panzer II and III tanks in combat. The Belgium army had a number of Renault FT tanks when the Germans invaded in 1940 but kept them in storage. They never saw action. The two man Renault FT on display at the Tank Museum, Bovington does not have an engine and has recently been repainted with a black livery. It was given to the British Imperial War Museum in London after WW1. It was transferred to the Tank Museum in Bovington in 1965.